Lincoln and Districts Community Care have their headquarters at 16 Lyttelton Street Lincoln and have been caring for communities surrounding Lincoln in the Selwyn District for just on 40 years. The impetus to establish Community Care Lincoln came about in August 1977, when two Tai Tapu ladies who were Red Cross volunteers approached the Lincoln Medical Centre, requesting that rural families should be given support like those in need in the city were receiving. This led to a doctor from the Medical Practice to be invited to be the guest speaker at Lincoln Rotary’s weekly meeting. Lincoln Rotary took up the challenge to run public meetings to gauge the support in the Lincoln and surrounding areas. The support was quite outstanding and by the end of September 1977 a Steering Committee had been elected with a challenge to prepare a plan and Constitution by the end of February 1978. A public meeting was called for 5 April 1978 with a very big attendance and by the end of the meeting it was agreed that Community Care Lincoln be established. For the first several years’ volunteers carried out the day to day tasks with a Board of Management overseeing the new organisation. Over the next almost 40 years Community Care Lincoln has out grown the small concrete block building which was attached to the Community Hall (demolished a few years ago) and now occupy a 230 m2 purpose built home, employing 3 full time staff. The building also accommodates the Nurse Maude District Nurses. When Community Care was established it was run mostly by volunteers, and still today volunteers form a very large part of the success of the Association. With the passage of time the services that Community Care provides are not just from their Lyttelton Street base. One of the staff is responsible for the Pegasus Health, Partnership Community Work (PCW) which entails making contact with citizens in the Selwyn area to help them access the services (mainly medical and social) that are available. Our Pegasus Health, PCW worker is presently traveling up to 10,000 kms a year throughout much of the Selwyn District, using her private car. Often, she is required to transport her clients to appointments or for Hospital treatment. This can include taking a ‘wheelchair’ or a ‘walker’. Many of these people are elderly and struggle to get into her car. Yet again Lincoln Rotary stepped up through their representative on the Community Care Board, aware of the need to find a solution to the ever-increasing need to provide care, away from the base. Late last year a committee was established with Rotarians Ross Mitchell, Pat Nicholas, Graham Williams and the PCW worker Gabi Pile who researched the best way forward to support the work that Gabi was excelling with. It quickly became obvious the solution was to somehow provide a suitable car. With funding, offered by Lincoln Rotary and the Rotary Foundation, Community Care agreed to commit a similar amount. The Committee felt that the funds being offered would not achieve the goal that they had set. It was decided that an approach be made to a Motor Vehicle dealer with a view to obtaining a more reliable car than may have been secured with the funding available. This approach was successful and a Toyota Corolla Hatch back car was secured with help from Miles Toyota. 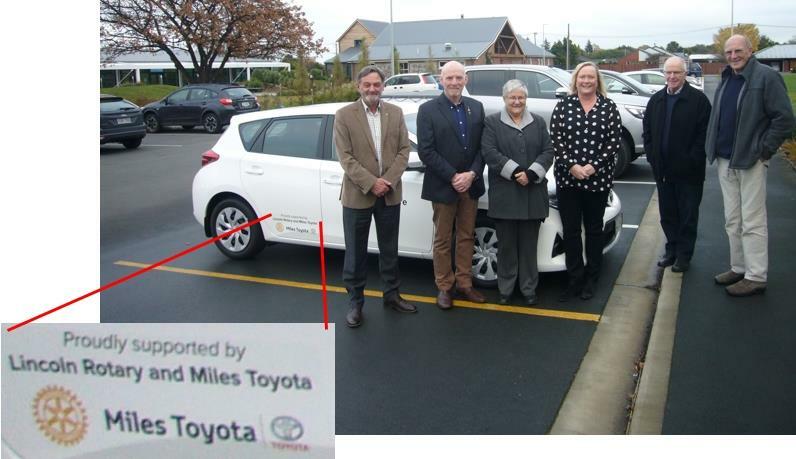 The car was handed over on a cool Monday morning by Rotary President David Jones to Community Care Chair Janice Burnett with a delighted Gabi in attendance along with the car committee. Janice Burnett thanked Rotary for their continuing support and also the support of Miles Toyota. Janice also made note of the work that Gabi does in the district and the achievements of the members of the car committee. The sign written white Corolla car is easy to recognised, and Gabi would love to get a wave or a smile to help make her day.